Cutting logs normally brings chainsaws to mind, they perhaps the most essential bit of kit for preparing your logs for burning, weather you are felling trees or just cutting logs or trunks to length ready for splitting. Where am I most likely to find myself using the chainsaw – to expand on this will you be using it mainly at home or will you be going to a site away from home when cutting logs to length. Or as some opportunist do, they keep the chainsaw in their car just in case they see some fallen limbs on the road side that they can cut up and take home. Let’s consider these scenario’s by looking at using the chainsaw at home first, do you live on an estate or are you located more out of town and not to close to the neighbours. If you are on an estate or close to the neighbours, ask yourself are you going to annoy them by using a noisy petrol driven chainsaw, yes they do make a racket and when you are cutting logs for a few hours at a time you will soon upset your neighbours. 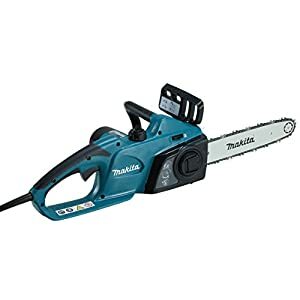 So in this case it would be better to go for an electric chainsaw, this can be one that plugs into the mains or one that runs off a rechargeable battery, known as a cordless chainsaw. The corded chainsaw, one that plugs into the mains is great as you can use it for an unlimited amount of time because there are no batteries to discharge, but you are limited to only using were you have a mains socket. In comparison the cordless chainsaw, the one that uses rechargeable batteries can be used anywhere but it is limited in duration by the charge in the batteries. However, if you are going to be going to a wood yard, say a tree surgeons yard to cut your logs then the petrol powered chainsaw is going to be the best option for you. Generally they are more rugged than their electric alternatives, more powerful and very economical to run and 5 litre can of petrol will last you for ages. 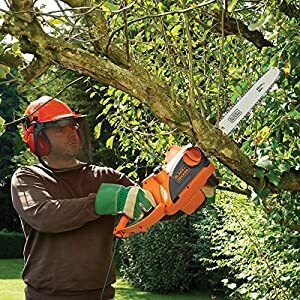 In addition to your chainsaw, you are going to need a few accessories to have handy at all times, for example at least one spare chain, tools to sharpen the chain, petrol can and two stroke oil. You also need to give some thought to personal protection while using your chainsaw, at the very least a strong pair of boots with steel toes caps, good gloves and eye protection, these are the very minimum requirements! Our shop has a whole range of safety equipment specially designed for the chainsaw operator.